Hartlepool council, Co Durham; caused by the resignation of Ray Martin-Wells who was leader of the Conservative group. He had served since 2010, originally being elected as Ray Wells for Park ward before marrying Andrew Martin and transferring to Rural West ward in 2012. In his resignation announcement Martin-Wells indicated that he was about to become a grandfather and was looking to spend more time with his growing family. Anybody who has followed this column through the years will know that Hartlepool has a good claim to be the most politically interesting of towns. The prejudices are familiar: Brexit Central; economically deprived provincials; monkey-hangers. And that’s just what my dad (a Hartlepudlian himself) gets called. Unbelievable, Jeff. Well, let me take you to a part of Hartlepool which might make you think again about some of those prejudices. Even a place like Hartlepool has to have a prestigious, desirable area; and Rural West ward is it. Rural West has existed only since 2012; despite what might appear from the name and the map, it is the successor to the former Park ward in west West Hartlepool. The name of Park ward was taken from Ward Jackson Park, which itself takes its name from Ralph Ward Jackson. A classic early-Victorian-era entrepreneur, Ward Jackson had been the driving force behind the Stockton and Hartlepool Railway which linked the ironworks at Stockton-on-Tees to the port at Old Hartlepool, on the headland. Or, at least, that was the plan; but the port at Old Hartlepool needed redevelopment to handle the railway traffic, and the town fathers spent so long arguing over the necessary technological solutions to facilitate their trade policy that Ward Jackson lost patience. Instead he went for the No Deal option, developed a series of railway-connected docks on sand-dunes a couple of miles to the south-west of Old Hartlepool, and founded a new town to serve them – West Hartlepool. Appropriately, Ralph Ward Jackson would later go on to become the first MP for the two Hartlepools, serving under the Conservative banner from 1868 to 1874. The Hartlepools merged into a single town in 1967 and now, still rather uneasily, form one borough. Ward Jackson Park in turn gave its name to an area of housing called West Park, most of which has sprung up since 1980. This is a series of privately developed housing estates which essentially house the middle-class of Hartlepool; in the 2011 census Park ward had by far the highest owner-occupation rates and the lowest no-qualification rates in the town. This is Hartlepool’s least-deprived area and has some of its most expensive housing – although still very cheap if you’re looking at property through a London lens, with the median house in the ward going for around £160,000 to £200,000. Drive along Catcote Road into the ward from the Owton Manor estate, and the change in affluence is palpable. As the name Rural West might suggest, this is not just West Park, and the ward also contains six of the seven rural parishes within the Hartlepool borough boundary. The largest of these is Greatham (Gree-tham, my family always said) on the old road to Stockton, which was a ward of its own until 2012; Greatham ward’s 2011 census return had the fifth-highest White British population (99.1%) and the sixth-highest population born in the UK (98.8%) of any ward in England and Wales. The rest of Rural West ward was covered in 2011 by the rural Elwick ward, including a small part of Wynyard Village. A recent and very exclusive development – Duncan Bannatyne and Alan Shearer are reportedly present or former residents – Wynward Village is mostly covered by Stockton-on-Tees council but part of it has spilled over the boundary. Elwick and Greatham normally returned independent candidates to Hartlepool council, but before 2012 Park ward was the only reliable Conservative area of the town. And it’s Conservatism which has characterised Rural West’s elections since its formation. UKIP – who were well-organised in Hartlepool – ran second at each election from 2012 to 2018, when they gave up; in May’s ordinary election the Conservatives had 58%, with an independent in second on 18% five votes ahead of Labour. Defending for the Conservatives is Mike Young, who is finally getting a shot at a winnable seat: he fought the Seaton by-election last year and stood in De Bruce ward in May. Independent candidate James Brewer returns to the fray after his second-place finish two months ago. Completing the ballot paper are Yousuf Khan for Labour and Michael Holt for the Green Party. Darlington council, County Durham; caused by the death of Labour councillor David Regan at the age of just 46. Described as a committed community activist, Regan had served since 2007; he was originally elected for Cockerton West ward before transferring here in 2015. Back in the day, when both were league sides, Hartlepool’s main football rivalry was with Darlington. A product in large part of the Industrial Revolution, Darlington was of course one end of the Stockton and Darlington Railway, which opened in 1825 to link the town with the Durham coalfield; and the railways stayed here to develop Darlington into a major engineering centre. Engineering is still important to the town, but it says something for the post-industrial decline of the North that Darlo’s largest employers now are EE, the mobile phone company. No doubt some of EE’s employees are electors in Cockerton ward. Although the ward grew from and is named after a pre-existing village, most of Cockerton ward’s electors live in the Branksome area, a post-war council estate suburb on the western edge of Darlington. 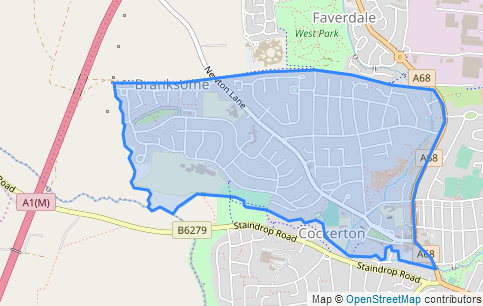 The present ward was created by boundary changes in 2015, merging the former Cockerton West ward (a safe Labour area) with part of Cockerton East (a key marginal); the 2015 result suggests that the new ward is safe Labour, the party’s slate topping the poll with 43% to 25% for the Conservative candidate and 17% for the Green candidate. There have been no local elections in Darlo since then, but the parliamentary constituency – a key marginal – was held by Labour in 2017 with almost no swing on two years before. For some reason this by-election has attracted a large field of candidates. Defending for Labour is Eddie Heslop, who fought a by-election in the neighbouring Mowden ward last year. The Tories have made the interesting selection of Scott Durham, who is a sitting Durham county councillor for Aycliffe North and Middridge division; despite being an accountant as well, he is apparently confident that he can adequately sit on two different councils at once. (We will return to this subject next week.) The Green candidate is Terri Hankinson, who fought the neighbouring Brinkburn and Faverdale ward in 2015. Also standing are independent candidate Joel Alexander, Kevin Brack (UKIP candidate for Darlington in 2017) for the anti-Islamic For Britain Movement, and Charlie Curry for the Liberal Democrats. Barnsley council, South Yorkshire; caused by the resignation of Labour councillor Anita Cherryholme who had served since 2011. For our last poll in the North we come to that stereotypical Yorkshire town, Barnsley. The Old Town ward name might suggest a district of noted mediaeval or historic buildings, or an area where trade has gone on for many years; if that is indeed the case it’s strange that Barnsley’s tourist literature doesn’t mention it. 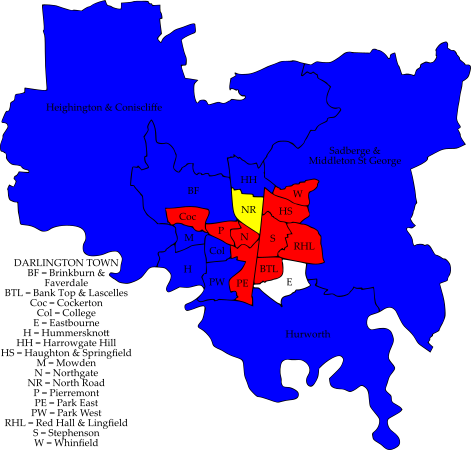 There are essentially three parts to this ward: the Old Town district itself, which lies immediately to the north of Barnsley town centre; the Honeywell area to the east of the railway line, a deprived 1960s council estate; and the Smithies area on the far side of the River Dearne, which was administratively part of Monk Bretton until 1974. The major employer within the ward is Barnsley Hospital, in the Old Town area. 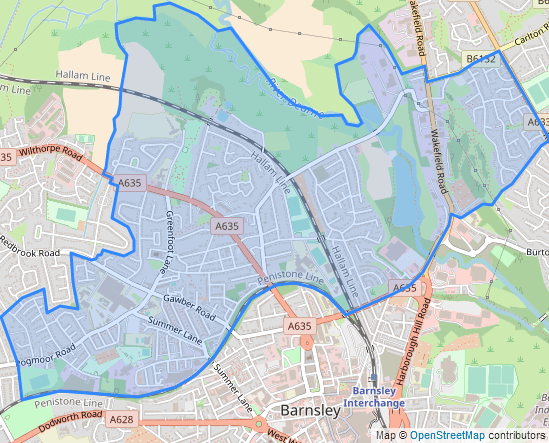 For much of the Noughties this ward was a stronghold of the Barnsley Independent Group, a localist party which at its peak threatened Labour’s control of the council. However, the BIG were affected by a Labour resurgence from 2010 and have won Old Town ward only once since then, in 2014. The BIG councillor didn’t seek re-election in May and the ward was an easy pickup for Labour to restore their monopoly: they defeated an independent candidate by the score of 55-22. This by-election will have a different feel to it as, for the first time since the ward was created in 2004, there is no independent candidate. Defending for Labour is Jo Newing, who fought her home ward of Penistone West in May and unexpectedly and resoundingly lost it to the Liberal Democrats, who had no track record in that ward. Returning from May’s election here are Conservative candidate Clive Watkinson and the Lib Dems’ Kevin Bennett. Tony Devoy is hoping to mop up the regionalist vote as candidate of the Yorkshire Party, while the populist or far-right vote (depending on your political tastes) will be squabbled over by Gavin Felton of the Democrats and Veterans Party and Christopher Houston of the British National Party, which had some decent third places here a decade ago. Rutland council; caused by the resignation of Conservative councillor Richard Clifton. He had served since winning a by-election in October 2014, and is standing down due to a new job. For our Midlands by-election we are in the county town of England’s smallest county. 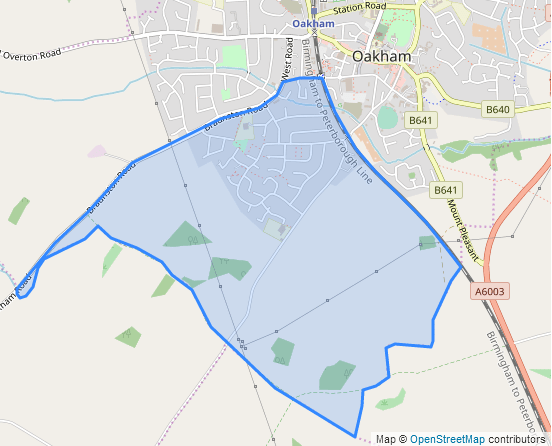 This ward is very well described by its name, being the south-west quadrant of Oakham; the northern boundary is Braunston Road, the eastern boundary is the railway line. Most of the housing in this ward dates from the late 1970s as Oakham expanded. The Conservatives have consistently held at least one of the two seats in South West ward, but the other seat has been volatile. In 2003 it was won by Cedric Phillips of the Lib Dems, who lost his seat in 2007 to the Conservatives’ Heather Wells. In 2011 Wells stood down and the other Tory councillor Peter Jones lost his seat to an independent candidate, David Richardson, by two votes; Joanna Figgis held the other seat for the Conservatives. Figgis resigned in 2014 – she was moving away due to her husband’s work – and the Conservatives’ Richard Clifton held the by-election. Clifton was re-elected at the 2015 election seven months later; independent councillor David Richardson stood down and his seat went to another independent, Oliver Bird, who topped the poll. Shares of the vote were 51% for the independents and 49% for the Conservatives, so one seat each was an equitable outcome. Defending for the Conservatives, and in the unaccustomed position for a C of bottom of the ballot paper, is Richard Clifton’s mother Patsy who formerly ran the family clothing and tea shop in Oakham. There is an independent candidate, Richard Alderman who used to run a menswear store in the town. Also standing are Chris Brookes for Labour and Joanna Burrows for the Liberal Democrats. City of London Corporation; an Aldermanic election, with Alderman Peter Hewitt seeking re-election. We return to the City of London for the second of a two-part series on its Aldermanic elections. Last week Emma Edhem and Robert Hughes-Penney were elected as Aldermen for Candlewick and Cheap wards respectively; Edhem’s election leaves a vacancy in the Court of Common Council for Castle Baynard ward, and a by-election will be held there in due course. This week there were due to be two polls where Aldermen had submitted themselves for re-election; it’s common for such re-elections to be uncontested, and when nominations closed nobody had opposed Sir Alan Yarrow’s re-election as Alderman for Bridge and Bridge Without ward. This column sends its congratulations to Sir Alan, who was formally re-elected at the Wardmote last night. That leaves a contested election in Aldgate ward. This is in the east of the City, with the name referring to one of the gates in the old London Wall – in this case, leading onto the old Roman road towards Colchester. Queen Matilda of Scotland, wife of Henry I, founded an Augustinian priory here, Holy Trinity Aldgate; Chaucer had an apartment above the gate itself; and the ward was a centre of historical London’s Jewish population, with the capital’s first synagogue opening in 1698 on Bevis Marks. The Whitechapel Bell Foundry, the UK’s oldest manufacturing company until its closure last year, started life in Aldgate ward in 1420. 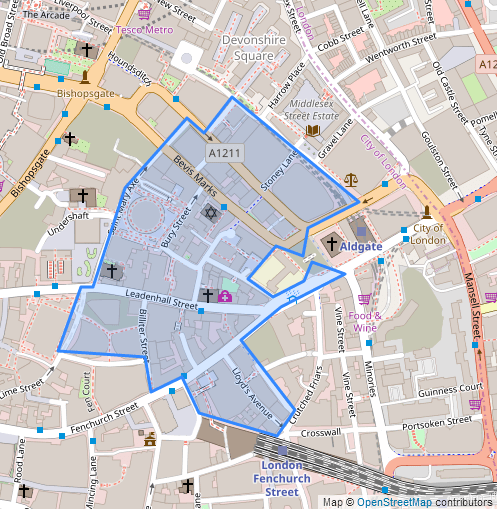 This being the City it’s business voters that will elect the new Alderman, and in Aldgate ward insurance is the main business in town. Within the ward boundaries lie the “Gherkin” at 30 St Mary Axe, once named after Swiss Re and still home to their UK offices; the Gherkin occupies the site formerly occupied by the old Baltic Exchange building which was destroyed in an IRA bombing in 1992. Despite that the Baltic Exchange is still on St Mary Axe, while at the other end of the ward is 71 Fenchurch Street, home to the Lloyd’s Register of Shipping. Peter Hewitt, who has served as Alderman for Aldgate since 2012, is seeking re-election for a second and final term – he is 65 and will reach the Aldermanic retirement age in 2023. His business background is in corporate finance and property. In a straight fight he is challenged by Susan Langley, whose insurance credentials are impeccable: currently chairman of the UK branch of the American insurers Arthur J Gallagher, Langley has had a long career in the industry and was appointed OBE in 2015 for services to women in business. This could be one to watch. Elmbridge council, Surrey; caused by the resignation of Conservative councillor James Vickers after 26 years’ service on Elmbridge council. The Mayor of Elmbridge in 2009-10, Vickers had lived in Stoke d’Abernon for 40 years; in his working life he had been a professional soldier before working in the arts and in commerce. We started this column with the most desirable and expensive part of Hartlepool; now let’s move to one of the most desirable and expensive places within the M25 London orbital motorway. Oxshott and Stoke d’Abernon are Surrey villages which the Green Belt stopped London from swallowing up, and they lie in attractive woodland while being on a fairly quick commuter line into Waterloo. Add to that Chelsea FC: their training ground is in Stoke d’Abernon and the club have a rule that players should not live more than six miles away, so a significant number of the electors are professional footballers with the sort of salary that implies. (It’s not clear whether Chelsea’s World Cup players Gary Cahill, Thibaut Courtois, Olivier Giroud, Eden Hazard, N’Golo Kanté and Ruben Loftus-Cheek are resident in this ward; if so hopefully they have sorted out an absent vote given that they are still in Russia.) So while the median house in West Park, Hartlepool will come with change from £200,000, the median house in Oxshott and Stoke d’Abernon weighs in at over a million pounds sterling. Unbelievable, Jeff. You could buy your columnist’s street for that. The ward’s demographic is pretty much what you would expect from that introduction. 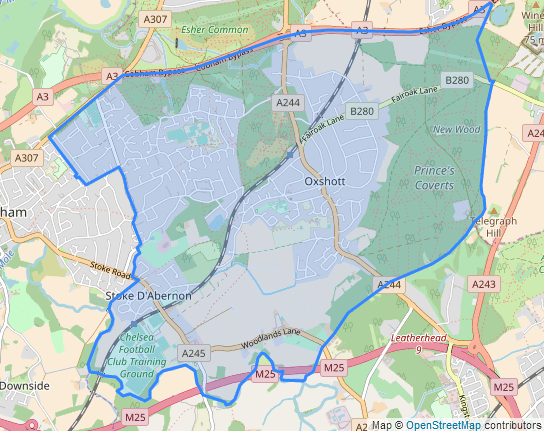 In the 2011 census Oxshott and Stoke d’Abernon ward was in the top 40 wards in England and Wales for residents who were “looking after home or family” – which presumably is the Surrey equivalent of the stockbrokers’ wives you get in Wilmslow – and was just outside the top 50 for the census “higher management” occupational category, with strong representation from the financial, scientific and technological sectors. 57% of the workforce are in some sort of management position and 53% hold degrees; 18% were born outside the EU, most of those being from the USA. Boundary changes for the 2016 election transferred into the ward much of the former Cobham Fairmile ward, whose social makeup is not dissimilar. Now this by-election is crucial. Elmbridge council is currently hung; the Tories defeated a coalition of the Residents Associations and Lib Dems last year but only hold 23 out of 48 seats, plus this vacancy, compared with 15 Residents and nine Lib Dems. The Residents are not contesting this by-election (the Stoke d’Abernon Residents Association doesn’t stand in elections), but the Lib Dems are; and a gain for them would tip the balance to 23 Tories and 25 opposition councillors. So, what are the chances of a Tory loss? Short answer: not great. On the former ward boundaries the Conservative party was capable of breaking 80% of the vote in a good year; and they had no trouble winning all three seats on the new boundaries in 2016. This was a three-seat first-past-the-post election with the top candidate due to serve until 2020, the second elected candidate until 2019 and the third elected candidate until 2018; a problem for James Vickers who tied for second place with his running-mate Andrew Burley on 1,474 votes each. Fortunately there wasn’t a penalty shoot-out; instead lots were drawn to see who got the three-year term, and Burley clearly lost the tiebreak because he was re-elected in May with 77% of the vote. 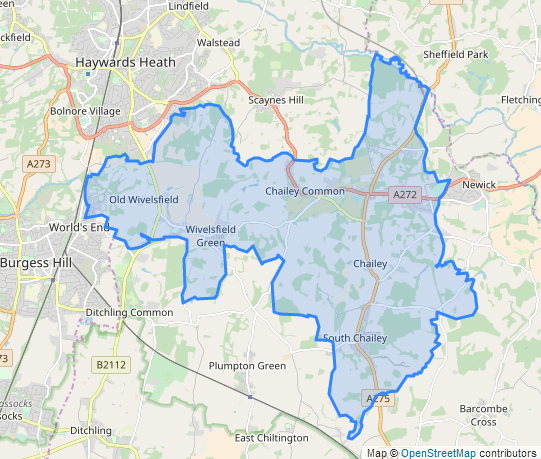 In last year’s county elections the Conservatives did come close to losing one of the county divisions covered by this ward, holding off the Lib Dems in Hinchley Wood, Claygate and Oxshott by just 126 votes; but it’s the Claygate part of that division which the Lib Dem vote comes out of. Defending for the Tories is David Lewis, who has recently retired as a senior manager for a multinational oil company; his wife Mary is the county councillor for Cobham division, which includes Stoke d’Abernon. Lewis is opposed by Dorothy Ford for the Lib Dems and Nicholas Wood for UKIP. 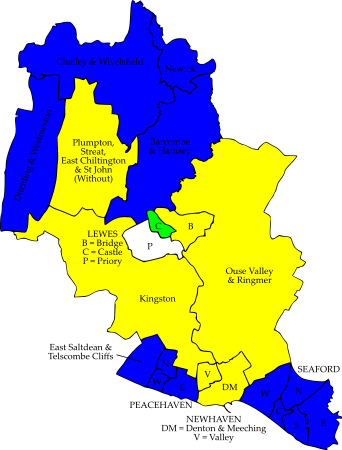 Lewes council, East Sussex; caused by the resignation of Conservative councillor Cyril Sugarman who had served since 2007. We move out of the immediate London orbit into the Low Weald of Sussex. This is a series of small villages to the south and south-east of Haywards Heath, just outside the South Downs National Park: Wivelsfield Green, North Chailey, Chailey and South Chailey. It should be noted that Wivelsfield railway station is not in the ward; the station is in the town of Burgess Hill. 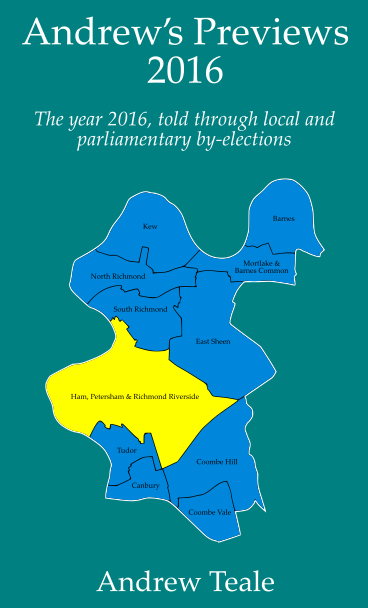 Despite the ward’s presence in a parliamentary constituency held by the Lib Dems until 2015, this is a true blue area. In 2015 the Tory slate had 49% here, to 26% for the Lib Dem slate and 13% for the UKIP candidate; and the Tories were further ahead in the 2017 county elections for the Chailey division. Defending for the Conservatives is Nancy Bikford, a lawyer from Wivelsfield Green. The Lib Dem candidate is Marion Hughes, who had a near-miss in 2015 in the neighbouring ward of Barcombe and Hamsey. UKIP have not returned, so completing the ballot paper are Brenda Barnes of the Green Party and Nicholas Belcher for Labour. East Dorset council; caused by the death of Conservative councillor Boyd Mortimer at the age of 71. He had been an East Dorset councillor since 2003, representing Verwood Newtown ward until 2015 and Verwood East since then; in his younger years he was a keen rugby player, turning out at centre for Wimborne RFC. We finish this column with a series of farewells. Local government reorganisation will come into force in 2019 for several counties in southern England, and this week will almost certainly see the final by-elections to two district councils before their demise. One of those is East Dorset council, which will be subsumed into a larger Dorset council next year. 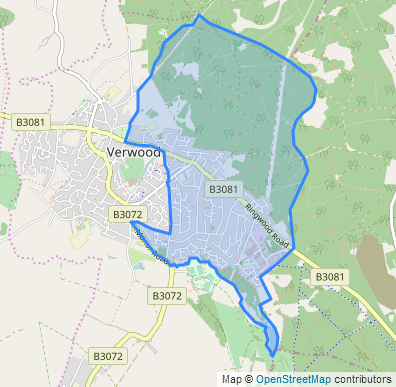 The last East Dorset by-election comes in Verwood, a town close to the Hampshire boundary. Verwood has been known since ancient times for pottery, but the pots are now gone and the town is rather isolated – the nearest major urban centre is Poole, around fifteen miles away. Consequently Verwood’s population tends to the old side, particularly the eastern side of town – Verwood Stephen’s Castle, the ward which covered most of this area at the time of the 2011 census, had a 24% retired population in its census return and made the top 50 wards in England and Wales for owner-occupation. There is absolutely nothing to go on in terms of previous results, as the 2015 contest was the first on these boundaries and no-one opposed the Conservative slate. 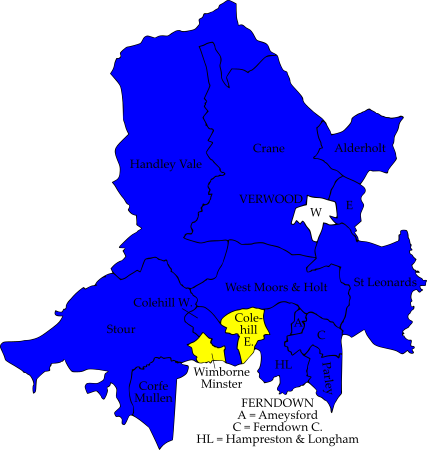 The ward is part of a two-seat Verwood county division which was very safely Conservative last year. This by-election is however contested: Colin Beck defends for the Conservatives; Sandra Turner challenges for Labour. Norfolk county council; caused by the resignation of Conservative councillor Cliff Jordan, who has since died at the age of 73. Described as a larger-than-life figure, Jordan was the leader of Norfolk county council until May this year, when he stepped down after being diagnosed with the lung cancer which killed him shortly afterwards. Jordan had served on Norfolk county council since 2001 and was also a Breckland district councillor for 24 years. 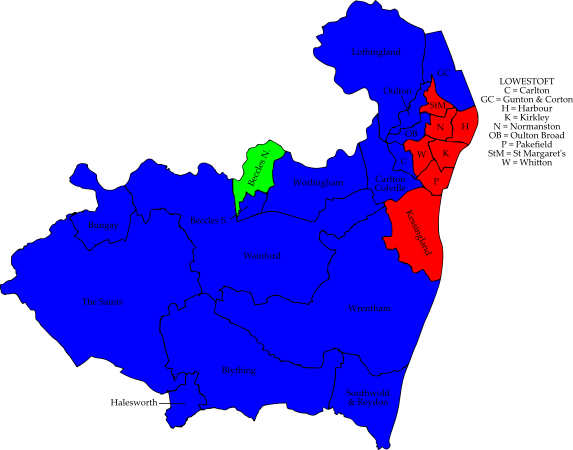 We move into East Anglia for our final three polls, starting with a division of twelve parishes in rural Norfolk which covers much of the area between Dereham in the north and Attleborough in the south. This is one of those rural agglomerations of parishes that don’t really have much in common, and the name Yare and All Saints rather gives the game away in that respect; it refers to the River Yare, which rises in the division, and a ward of Breckland district council which ceased to exist in 2015. 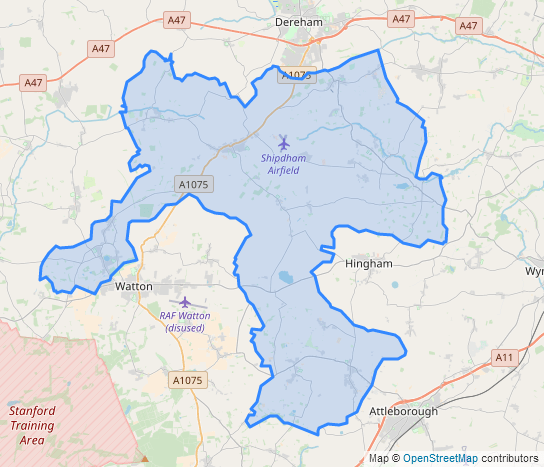 The largest centre of population, accounting for slightly less than a quarter of the electorate, is Shipdham which was a centre for the USAAF during the Second World War; Shipdham Airfield still exists but is now in private ownership. 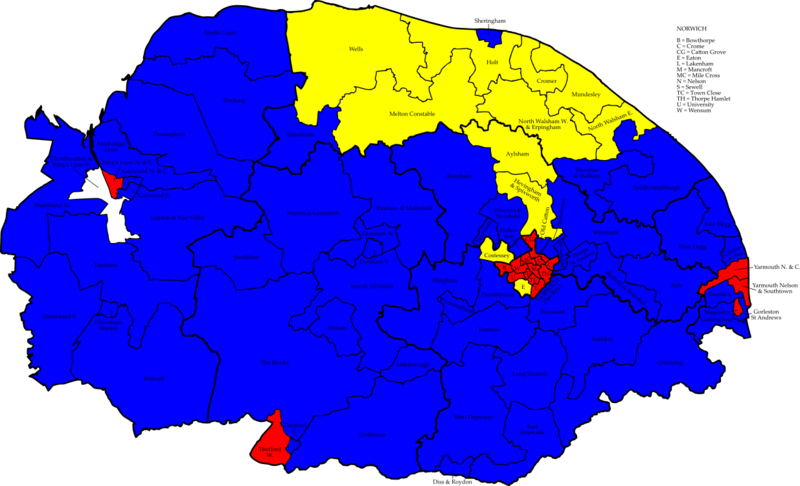 Cliff Jordan was given a scare by UKIP in 2013, when he held his seat by just 132 votes; but Yare and All Saints is generally a true blue area and returned to that status in 2017 when Jordan beat the Liberal Democrat candidate 73-15. 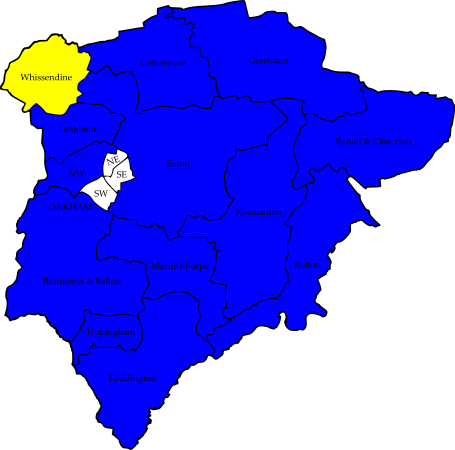 The division boundaries don’t match up with the Breckland district council wards introduced in 2015; however, the Conservatives hold all the local district council seats. One of the Tory district councillors, a keen huntsman, resigned in early 2017 after being caught reacting in a less than gentlemanly manner towards a foxhunting protestor; the Conservatives easily held the resulting by-election. So the Tories should be favoured to hold here. Their candidate is local resident Ed Connolly, a Household Cavalry veteran who has since forged a career in the hotel industry. The Lib Dems have selected another local resident, Andrew Thorpe who has been campaigning hard on an anti-development ticket. Completing the ballot paper is Labour’s Harry Clarke. Waveney council, Suffolk; caused respectively by the resignation of Labour councillor Sonia Barker and the death of Conservative councillor Sue Allen. Barker was first elected in 2011 and had been leader of the Labour group on Waveney council. Allen had served since 2004, originally being elected as an independent before joining the Conservatives in time for the 2008 election. We finish for the week by looking wistfully out on the North Sea from the Suffolk coast, as we discuss what are likely to be the last by-elections to Waveney district council before it is abolished in April 2019, with its functions transferring to a new East Suffolk district council. These two wards are both coastal but are very different in character. Pakefield is the southern end of the Lowestoft built-up area, and was incorporated into Lowestoft in 1934; however, the place goes back a lot further, as archaeological remains – specifically, flint tools – have been found which are over 700,000 years old. The Pontin’s holiday camp is outside the ward boundary, but there is a caravan park on the rapidly-eroding clifftop if you fancy staying here. 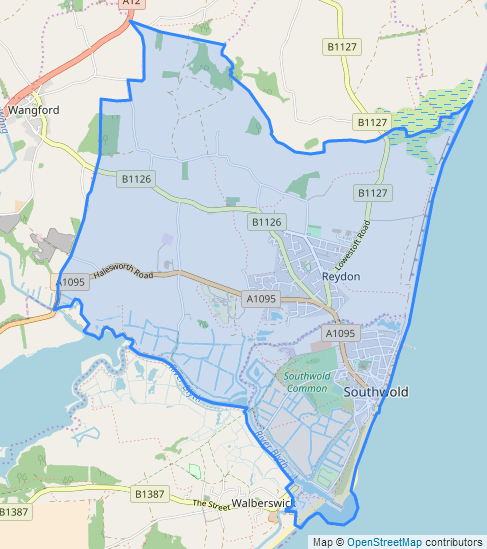 Further to the south is the ward of Southwold and Reydon, which is in slightly better economic condition than Pakefield but has a very old population: the ward is in the top 50 in England and Wales for residents over the age of 64, and the median age is somewhere north of 45. Reydon is now the larger of the two by population, but Southwold is the more important settlement: it is an ancient town, small harbour and resort at the mouth of the River Blyth. The town’s major export is beer from Adnams Brewery, which is also its largest employer. So, two wards which are chalk and cheese; and their political history reflects that. 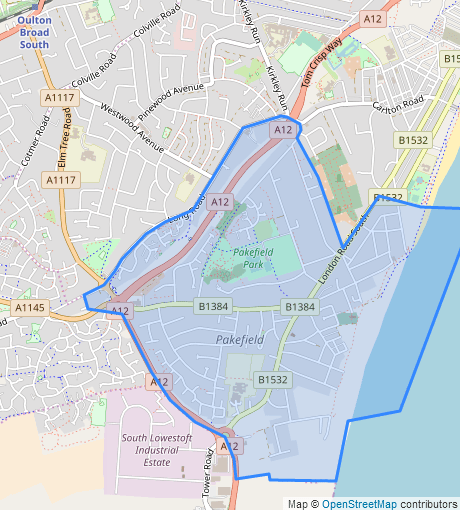 Pakefield has for some time been a key marginal between Labour and the Conservatives although in the last fourteen years the Tories have only won it once, in 2004 with a margin of thirty votes. The 2015 result here had 46% for the Labour slate to 32% for the Conservatives and 13% for the Green Party, but the Tories were closer to winning a seat than those raw figures indicate; and since 2015 the Conservatives have performed very strongly in the Lowestoft area, gaining all of the town’s county council seats in May 2017 and gaining a district council by-election in the town since then. This ward is covered by the Waveney constituency, the only seat in England and Wales which voted Leave in 2016 where the Labour vote fell in 2017; so clearly something is going on here politically. Southwold and Reydon was closely fought between the Conservatives and independent candidates in the early Noughties, but the two former independent councillors – Allen and Michael Ladd – subsequently joined the Conservatives. In consequence there is no longer much of interest in the ward’s elections: in 2015 the Conservatives had 50% of the vote to 20% for Labour and 15% each for the Greens, who took third place six votes ahead of UKIP. The defending Tory candidate in the Southwold and Reydon by-election is David Burrows, who is hoping to make a big noise among the electorate: he is the Southwold town crier. Returning from the 2015 election, where he was runner-up, is Reydon resident John Cracknell who is standing again for Labour. There is no Green candidate this time, so completing the ballot paper are Mike Shaw for UKIP and David Beavan for the Liberal Democrats. The difficult task of defending Pakefield for Labour falls to Paul Tyack, vice-chairman of the Waveney branch of the party; he works for the Marine Management Organisation, a quango which runs functions such as marine planning and fishing quotas. That occupation will no doubt give extra impetus to the Conservative candidate Melanie Vigo di Gallidoro, who used to run a fishing company with three North Sea trawlers; Mrs Vigo di Gallidoro was formerly a Waveney district councillor from 1979 to 1986, and last year returned to public office by being elected to Suffolk county council from Pakefield division (which is larger than this ward). The Greens’ Peter Lang, a Lowestoft town councillor, reportedly won an award recently for losing over six stone in weight, but is hoping that as far as this election is concerned he’ll be a winner rather than a loser. Also standing are Adam Robertson for the Lib Dems and UKIP’s Phillip Trindall.